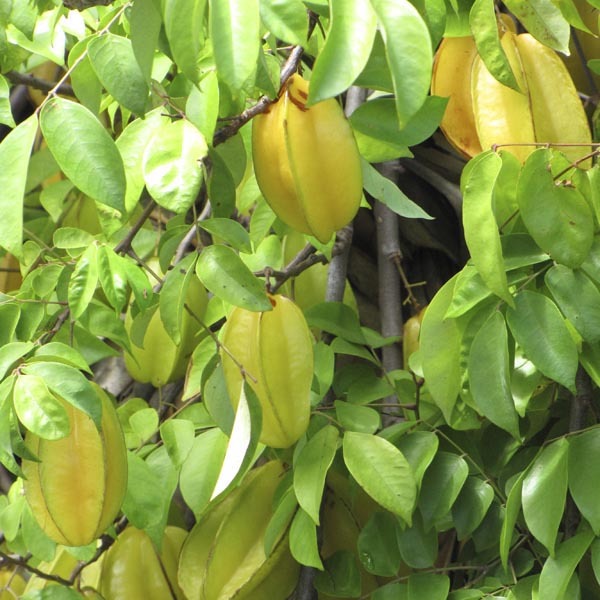 Slice into a Carambola fruit and it's easy to see where it gets its other common name: "star fruit". The cross-section reveals a delightful star shape! A fun, ornamental, and useful tree for frost-free climates. The fruits are produced over a long season starting in early spring. Harvest when they are fully yellow and the ridged edges are turning brown. Easy to prepare; just wash, trim away the brown ridges, slice, and eat. A great choice for small spaces or where a small-scale tree is desired whether planted in the ground or in a container. Sliced fruits are great eaten fresh, in salads, or used as a decorative garnish on a platter of fresh vegetables, fruits, or desserts. An excellent source of vitamins A and C! Balanced liquid fertilizer monthly, applied according to the package directions. Keep well-watered during dry spells. Grows well in most soils with a good amount of organic matter. Well-drained soil is essential. Prune freely to maintain size.